For Mithilesh Kumar of Pachlakh village in the agrarian heartland of Bihar, it was a question of pratishtha or prestige. In a rural milieu it matters. Kumar lobbied hard to ensure the first telecom tower in the village was erected on his land and the contract for the tower’s upkeep and operations was awarded to him. That was in 2007. Today, he operates a second mobile tower in neighbouring Bheldi, also in Saran district. Money really wasn’t the real issue as he hails from an affluent family; to be associated with something new is what propelled him. When Tara Urja, an energy service company (ESCO), set up a 30 kW solar plant in Bheldi last year and proposed that he adopt solar to power his tower instead of firing a 20 kVA diesel generator, he quickly negotiated a deal. Again, he embraced the idea of aligning with an innovation which also fetched significant savings. Tower companies, quaintly, continue to supply him the usual 29 litres of diesel a day for each of his towers. He merrily flogs it in the market. Between the two towers, he earns Rs 90,000 a month including rental for land and upkeep fees. "Switching to solar has also gives me a lot of free time; else I was constantly tied down to the tower," says Kumar. "I am scouting for new businesses to keep me engaged." In power-starved rural Bihar and even UP, telecom tower companies and ESCOs are fast turning into key players in a new genre renewable energy ecosystem that is emerging. India has 77 million households — about 360 million people — without access to grid-electricity and another 20 million underserved households — 95 million people — that receive less than four hours of power in a day. While governmental efforts are on to improve grid connectivity, experts believe the number of underserved households are expected to decline by only 5% over the next 10 years. The gap remains. It’s not that nothing has been done to brighten the lives of people living in the dark. There has been a degree of governmental, NGO and private sector involvement in off-grid energy solutions —mostly the provision of solar lanterns, solar home systems (SHS) and delivering power through distributed renewable energy (DRE) projects. Selco, one of the pioneers in SHS, has installed over 125,000 systems, mostly in Karnataka. This first flush of off-grid solutions, however, is limited to household lighting with consumers paying around Rs 100 a month for a single bulb with mobile charging facilities; more if additional bulbs are included. These are the typical Business-to-Consumer (B2C) models. While this model has been proliferating, votaries of DRE are keen on taking off-grid solutions to the next level. Both ESCOs and consumers are apparently on the threshold of scaling up and climbing the energy ladder. Why Just Households? Providing a couple of bulbs at home is fine, and needed. As aspirations soar, the need to examine the entire bouquet of power needs of a household – higher wattage applications like TV, fans, irrigation pumps – is being felt. Why ignore the commercial needs in a village – shops, hotels with chillers and freezers, flour mills, ATMs, a petrol station if near a highway? DREs projects, or mini-grids with capacities to do all this is seen as a solution whose time has come. These mini-grids, primarily solar, mimic the main grid; power generated at a location in the village and wires strung across poles to individual homes and establishments. All energy needs of a community, not just lighting, are to be met. A Business-to-Business (B2B) component would be an ideal addition to prevalent B2Cs. Mini-grid solutions with capacities exceeding 25 kW to cater to basic commercial applications not only bring in different tiers of consumers but also lend a degree of robustness and resilience to the model. 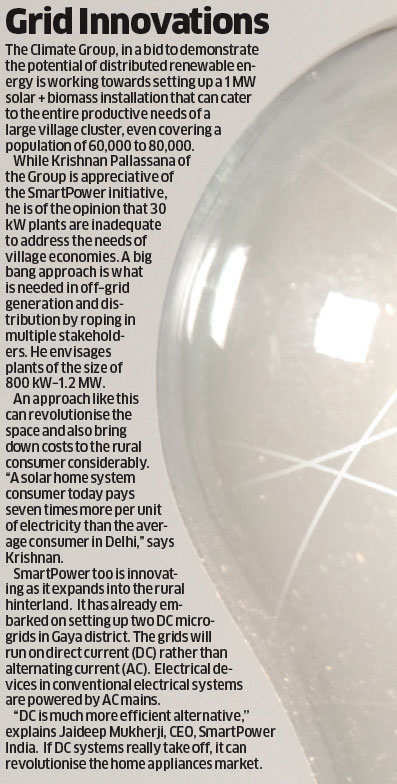 Again, it’s not as if mini-grids are a novelty in India. Sagar Island in the Sunderbans, for instance, has had a solar mini-grid since 1996. Mini grids cover over 1400 habitations in Chhattisgarh. These are largely governmental initiatives. Now, a strong business case for off-grid energy is being promoted. The idea is to attract robust private sector involvement in the mini-grids space and run them on commercial terms as viable, scalable, bankable entities. Husk Power and Mera Gao Power are prime examples in this space. "What India needs is a decentralised approach to energy access; let thousands of mini-grids emerge," says Krishnan Pallassana, Executive Director- India, The Climate Group. It’s beginning to happen. "We want to impact the village GDP through energy access," says Jaideep Mukherji, CEO, SmartPower India, a nonprofit company incorporated by the US-based Rockefeller Foundation and tasked with fostering a mini-grids ecosystem in India. 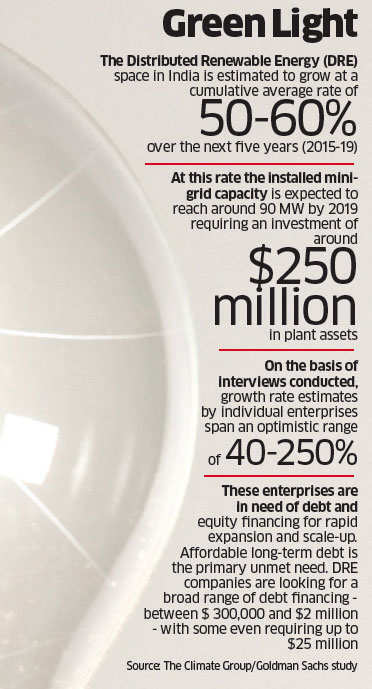 SmartPower, with an allocation of $75 million, is crafting coalitions of ESCOs, telecom tower operators and investors with the target of establishing 1000 plants in the next three years, impacting over a million lives. Over 70 grids are already up and running in UP and Bihar. A large consumer — a telecom tower or a rural bank — functions as an anchor in this model which is often described as the ABC (Anchor-Business-Community) model in developmental parlance. ABCs accord a degree of financial and operational stability to mini-grids as around 30% of power can be signed out to one anchor load. Along with households there is a clear focus on commercial users of power. Reliable, uninterrupted power is therefore critical. "A household consumer can be forgiving, not the commercial user," says Mukherji. Tara Urja, an ESCO, one of the five under the SmartPower fold, for instance, has incorporated a slew of measures to ensure grid reliability. Each of Tara’s electric poles in Bheldi village — 41 of them, carrying transmission wires over 1.5 km — have programmable load limiting devices affixed to them. "It prevents over-drawing of power by consumers than what is assigned to them, and can be remotely switched on or off," explains Binoy Kumar Sinha, Tara’s principal co-ordinator for Bihar. Indiscriminate drawing of power can destabilise a grid. Most of the eleven solar plants run by Tara in Bihar are of 30 kW capacities. The cost of erecting a plant is around Rs 35-40 lakh. Of these, Bheldi has an anchor in Mithilesh Kumar’s tower, so does Fakir-Toli with the local SBI branch tapping into solar power. The rest are still struggling to integrate ideal anchor loads. Though there are government guidelines to solarise rural telecom towers and many tower companies profess green intentions, on the ground there is considerable reluctance to switch. Bheldi village, with 150 shops and 35 households is an interesting study on the relevance of solar mini-grids. The village is connected to the main electric grid and the only period it received 18 hours of supply was during the recent state elections in Bihar. It’s now back to the usual, erratic, four hours supply. Bheldi is therefore served by triumvirate - the main grid. Tara's solar mini-grid and a couple of entrepreneurs running diesel generators - and yet the mini-grid competes, and well. The diesel operators charge Rs 7–15 a day (for three hours of supply.) Tara has pegged its tariff at Rs 120 a month for one 5W LED bulb and mobile charging (6 hours a day-primarily for households). "Tariff for commercial users for 10 hours of supply — from 10 am to 8 pm — is devised on a one-on-one basis depending on usage," says Sinha. A grocery with a freezer, for instance, will pay around Rs 1,500 a month. Seventy shops in Bheldi have subscribed for solar power. Only one household has signed up; a bit of an embarrassment. The challenges are many. Kasina village is not connected to the existing grid; yet, the initial response to the minigrid was quite frustrating. In the first six months, only 15 consumers had enrolled. Today, 130 of the 300 households are in. The Kasina plant, bereft of an anchor or a surfeit of shops as in Bheldi, runs at a mere 30% capacity. In Madhopur, response was so poor that Tara had to dismantle 15 Kw of solar capacity and move it elsewhere. Interestingly, the diesel operators in Bheldi are feeling the heat of competition. One operator is now sourcing power from the mini-grid and passing it on to his flock of 100 customers. "The other one also has sent us feelers," says Sinha. Bheldi may soon become a diesel-free village. It is not just the provision of power that SmartPower is keen on; it has a more expansive role to play given its philanthropic moorings. Powerful Objectives SmartPower would like to spur and support a host of energy-driven economic activities from scratch. This would mean ferreting out potential microentrepreneurs from villages and putting them through training regimens and also enabling access to capital. For starters, one such session was held in Gopalganj. It’s still early days. Identifying livelihood generation opportunities and skills building, evidently, has not been easy. SmartPower is also formulating a strategy that goes beyond individual-centric approaches; catalysing women’s tailoring enterprises, for instance, and linking them up with national or international value chains is a distinct possibility. "Wideimpact approaches are inevitable," says Mukherji. Meanwhile, entrepreneurial farmers like Satdev Tiwari of Hardia village are a solace. Tiwari has turned his water pumping needs into a business with a little help from Tara. He sources power from the mini-grid at Rs 45 an hour to run a new 3 HP irrigation pump to draw water from his tube well. Water is pumped to several farms spread over 20 acres. Tiwari charges farmers Rs 70 an hour for pumping water; Rs 100 if his labour is also solicited. The vegetable farmer didn’t have Rs 15,000 to invest in a pump and accessories at one go. Tara crafted a scheme for Tiwari; he paid Rs 6,000 (Rs 4,000 as security, Rs 1,000 connection charges, and Rs 1,000 as power-usage advance.) Tiwari has been promised that the ownership of the pump will be transferred to him after running it for 400 hours. India has 7 million pumps that run on diesel. The arrangement not only bolsters Tiwari’s earnings but also helps Sinha utilise his 30 kW plant capacity. A single irrigation pump takes 2.2 kW. Many others are queueing up for the scheme. Innovations on the ground are beginning to be thrown up but there are bigger issues to be tackled before mini–grids can really proliferate as sound businesses. The big questions are: what happens to renewable energy mini-grids when the main grid is ubiquitous? If the mini-grids are grid-ready or grid-interactive and are eventually integrated what would be the buy-back tariffs? There is a policy void today; a clear policy and regulatory framework are key for the long-term viability of the mini-grids business model. Only Uttar Pradesh is presently drafting a mini-grids policy. The issues are many: conversion of landuse; right of way issues related to stringing of electric wires across streets, fields; access to debt and working capital for entrepreneurs; the need to create conditions to attract investors to the nascent sector. The RBI, earlier last year, accorded priority sector lending status to renewable energy but banks remain hesitant about embracing mini-grid entrepreneurs. SmartPower India is attempting to bridge the gap by extending ESCOs soft long-term debt at interest rates of 8-10%. "Our debt offering can be further leveraged by entrepreneurs to attract more financing," says Mukherji. The Ministry of New and Renewable Energy (MNRE) has also not accorded mini-grids the rightful place it deserves. "This is perhaps because the prowess of mini-grids has not been demonstrated fully yet," says Krishnan. The effort has just about begun (see SmartPower’s Reach). 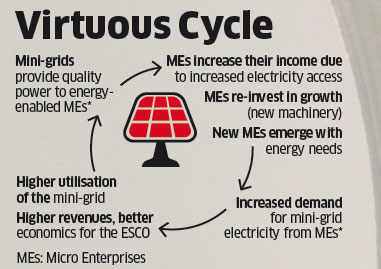 Tarun Kapoor, joint secretary in the MNRE who also holds the mini-grids portfolio, concedes the government has been partial to solar home systems (SHS) as it is believed to be the ideal route to bring left-out areas and scattered hamlets onto the energy map. Mini-grids too have a role to play in the energy matrix. "We have already written to all state governments prescribing mini-grid guidelines," reveals Kapoor. It addresses some concerns. When the main grid reaches areas where mini– grids are in operation, states have been advised to look at one of the three options: allow the minigrid to function as a licensee or franchisee of the power distribution company (discom); discom buys off the developer of the mini-grid; allow the mini-grid to operate in parallel, especially in situations where power availability from the main grid is unreliable. Kapoor also maintained that the stage is not right to regulate the functioning of mini-grids and that he wouldn’t want to meddle with tariff fixing too. "That is best left to market forces."